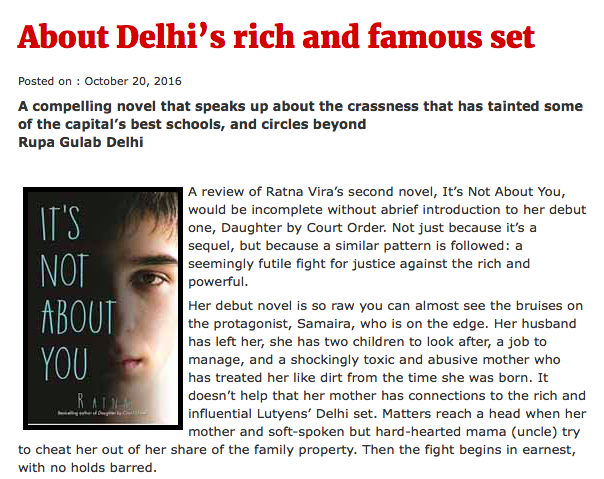 Rupa Gulab reviewed It’s Not About You for Hard News (20th October 2016), calling it a “must read”. What makes this book terribly interesting is its observations on Delhi’s high society, how our politicians sneakily try to control almost everything in the country, including getting on school boards and more. The long stint in hospital brings about a completely justified tirade on how posh hospitals are run as businesses and expensive tests, surgeries, et cetera are recommended not for the patient’s health but the hospital’s. I’d say this book is a must-read. Not just for parents, but for our beloved politicians who harass us and make our lives a misery in every possible way.